For the East German bloc party, see National Democratic Party of Germany (East Germany). The National Democratic Party of Germany (German: Nationaldemokratische Partei Deutschlands or NPD) is a far-right and ultranationalist political party in Germany. The party was founded in 1964 as successor to the German Reich Party (German: Deutsche Reichspartei, DRP). Party statements also self-identify the party as Germany's "only significant patriotic force". On 1 January 2011, the nationalist German People's Union (German: Deutsche Volksunion) merged with the NPD and the party name of the National Democratic Party of Germany was extended by the addition of "The People's Union". The party is usually described as a neo-Nazi organization. and has been referred to as "the most significant neo-Nazi party to emerge after 1945". The German Federal Agency for Civic Education, or BPB, has criticized the NPD for working with members of organizations which were later found unconstitutional by the federal courts and disbanded, while the Federal Office for the Protection of the Constitution (German: Bundesamt für Verfassungsschutz), Germany's domestic security agency, classifies the NPD as a "threat to the constitutional order" because of its platform and philosophy, and it is under their observation. An effort to outlaw the party failed in 2003, because the government had a large number of informers and agents in the party, some in high position, who had written part of the material used against them. Since its founding in 1964, the NPD has never managed to win enough votes on the federal level to cross Germany's 5% minimum threshold for representation in the Bundestag; it has succeeded in crossing the 5% threshold and gaining representation in state parliaments 11 times, including one-convocation entry to 7 West German state parliaments between November 1966 and April 1968 and two-convocation electoral success in two East German states of Saxony and Mecklenburg-Vorpommern between 2004 and 2011. Since 2016, the NPD is again not represented in state parliaments. Udo Voigt led the NPD from 1996 to 2011. He was succeeded by Holger Apfel, who in turn was replaced by Udo Pastörs in December 2013. In November 2014, Pastörs was ousted and Frank Franz became the party's leader. Voigt was elected the party's first Member of the European Parliament in 2014. Udo Voigt, former leader of the NPD, standing in front of a banner depicting Nazi leader Rudolf Hess. Hess, who died in prison in 1987, is considered a martyr by the NPD, and the party attempted to nominate him for a Nobel Peace Prize in 2007. The NPD also endorses certain beliefs about human nature. NPD leader Udo Voigt states that the philosophy of the NPD differs from both communism and social liberalism in that it acknowledges people as unequal products of their societies and environments, largely governed by what is called natural law. The NPD calls itself a party of "grandparents and grandchildren" because the 1960s generation in Germany, known for the leftist student movement, strongly opposes the NPD's policies. The NPD's economic program promotes social security for Germans and control against plutocracy. They discredit and reject the "liberal-capitalist system". The NPD argues that NATO fails to represent the interests and needs of European people. The party considers the European Union to be little more than a reorganisation of a Soviet-style government of Europe along financial lines. Although highly critical of the EU, as long as Germany remains a part of it, the NPD opposes Turkey's incorporation into the organisation. Voigt envisions future collaboration and continued friendly relations with other nationalists and European national parties. The NPD's platform asserts that Germany is larger than the present-day Federal Republic, and calls for a return of German territory lost after World War II, a foreign policy position abandoned by the German government in 1990. At one point, a map of Germany was shown on the party website omitting the border that divides Germany from Austria. The NPD also failed to colour in the Oder–Neisse line, the border which established the limits of federal Germany to the east and was agreed upon with Poland in 1990. The party continues to pursue a "people's front" of the nationals [consisting of] the NPD, DVU, and forces not attached to any party, which is supposed to develop into a base for an encompassing 'German people's movement'. The aggressive agitation of the NPD unabashedly aims towards the abolition of parliamentary democracy and the democratic constitutional state, although the use of violence is currently still officially rejected for tactical reasons. Statements of the NPD document an essential affinity with National Socialism; its agitation is racist, antisemitic, homophobic, revisionist, and intends to disparage the democratic and lawful order of the constitution. Udo Voigt and prominent American white nationalist David Duke. Voigt has held meetings with various proponents of white nationalism, including David Duke, a US white nationalist, author, politician, and activist. Between 1989 and 1992, the International Third Position began to ally itself with the NPD in Germany and Forza Nuova in Italy. They have been in contact with Youth Defence, the Irish anti-abortion group, since 1996. Justin Barrett, former leader of Youth Defence and current President of the National Party of Ireland, has spoken at their events in Passau in 2000. The party also has connections with far-right parties and politicians in Croatia. In 2017, according to the claims of Dražen Keleminec, president of the marginal far-right Autochthonous Croatian Party of Rights (A-HSP), NPD party member Alexander Neidlein took part in the party’s march to show their support and declare allegiance to then-recently elected American president Donald Trump. During the march, the party's members, dressed in black uniforms, were waving flags of the NPD and the USA while shouting the Ustasha salute "Za dom spremni". The following day, the U.S. embassy in Zagreb reacted by publishing a statement in which they strongly condemned the march and rejected any attempts to connect the USA with Ustasha ideology. In 2018, Croatian far-right MP Željko Glasnović took party in party congress in the town of Büdingen, expressing his support for them. In the 1950s, despite the overall failure of de-Nazification, early right-wing extremist parties in West Germany failed to attract voters away from the moderate government that had presided over Germany's recovery. In November 1964, however, right-wing splinter groups united to form the NDP. One of the four founding members was Adolf von Thadden (1921 - 1996), alleged to have been an agent for the British MI6. Thadden had a British grandmother and was NPD chairman from 1967 to 1971. Owing to von Thadden's effective leadership the NPD achieved success in the late 1960s, winning local government seats across West Germany. In 1966 and 1967, fuelled by West German discontent with a lagging economy and with the leadership of Chancellor Ludwig Erhard, the NPD won 15 seats in Bavaria, 10 in lower Saxony, 8 in Hesse, and several other seats. However, the NPD did not then and has never since received the minimum 5% of votes in federal elections that allow a party to send delegates to the German Parliament. The NPD came closest to that goal in the 1969 election, when it received 4.3 per cent of the vote. An economic downturn, frustrations with the emerging leftist youth counter-culture and the emergence of a coalition government between the center-right Christian Democratic Party (CDU), the Christian Social Union (the CDU's present-day sister party), and the center-left Social Democratic Party (SPD) helped to pave the way for those NPD gains. The coalition government had created a vacuum in the traditional political right wing, which the NPD tried to fill. Additionally, the party benefited from hostility to the growing immigrant population and fears that the government would repudiate claims to the "lost territories" (pre-World War II German territory east of the Oder-Neisse River.) The historian Walter Laqueur has argued that the NPD in the 1960s cannot be classified as a neo-Nazi party. Yet, when the coalition fell apart, around 75 per cent of those who had voted for the NPD drifted back to the center-right. During the 1970s, the NPD went into decline, suffering from an internal split over failing to get into the German Parliament. The issue of immigration spurred a small rebound in popular interest from the mid-1980s to the early 1990s, but the party only saw limited success in various local elections. Since its founding in 1964, the NPD has only won seats in regional assemblies. Its successes in state parliaments can be grouped into two periods: the late 1960s (1966 in Hesse; 1967 in Bremen, Lower Saxony, Rhineland-Palatinate, and Schleswig-Holstein; and 1968 in Baden-Württemberg and Bavaria), and former East Germany since reunification (2006 and 2011 in Mecklenburg-Vorpommern, 2004 and 2009 in Saxony). In the 2004 state election in Saxony, the NPD won 9.2% of the overall vote. After the 2009 state election in Saxony, the NPD sent eight representatives to the Saxony state parliament, having lost four representatives since the 2004 election. The NPD lost their representation in Saxony at the 2014 state election. They also lost all representation in Mecklenburg-Vorpommern at the 2016 state election. The NPD maintained a non-competition agreement with the German People's Union (DVU) between 2004 and 2009. The third white nationalist-oriented party, the Republicans (REP), has so far refused to join this agreement. However, Kerstin Lorenz, a local representative of the Republicans in Saxony, sabotaged her party's registration to help the NPD in the Saxony election. In the 2005 federal elections, the NPD received 1.6 per cent of the vote nationally. It garnered the highest per cent of votes in the states of Saxony (4.9 per cent), Thuringia (3.7 per cent), Mecklenburg-Vorpommern (3.5 per cent) and Brandenburg (3.2 per cent). In most other states, the party won around 1 percent of the total votes cast. In the 2006 Mecklenburg-Vorpommern state election, the NPD received 7.3% of the vote and thus achieved state representation there, as well. The NPD had 5,300 registered party members in 2004. Over the course of 2006, the NPD processed roughly 2,000 party applications to push the membership total over 7,200. In 2008, the trend of a growing number of members has been reversed and NPD's membership is estimated at about 7,000. In the 2014 European elections, Udo Voigt was elected as the party's first Member of the European Parliament. In 2001, the federal government, the Bundestag, and the Bundesrat jointly attempted to have the Federal Constitutional Court of Germany ban the NPD. The court, the highest court in Germany, has the exclusive power to ban parties if they are found to be "anti-constitutional" through the Basic Law for the Federal Republic of Germany. However, the petition was rejected in 2003 after it was discovered that a number of the NPD's inner circle, including as many as 30 of its top 200 leaders were undercover agents or informants of the German secret services, like the federal Bundesamt für Verfassungsschutz. They include a former deputy chairman of the party and author of an anti-Semitic tract that formed a central part of the government's case. Since the secret services were unwilling to fully disclose their agents' identities and activities, the court found it impossible to decide which moves by the party were based on genuine party decisions and which were controlled by the secret services in an attempt to further the ban. The court determined that so many of the party's actions were influenced by the government that the resulting "lack of clarity" made it impossible to defend a ban. "The presence of the state at the leadership level makes influence on its aims and activities unavoidable," it concluded. 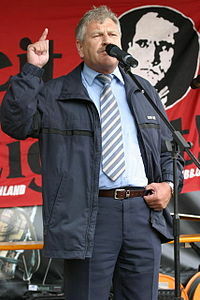 Horst Mahler (NPD), a former member of the far-left terrorist organisation Red Army Faction, defended the NPD before the court. In May 2009, several state politicians published an extensive document which they claim proves the NPD's opposition to the constitution without relying on information supplied by undercover agents. This move was intended to lead up to a second attempt to have the NPD banned. At the 2010 NPD party conference at Bamberg it was announced that the party would ask its members to approve a merger with the German People's Union (DVU). After the merger on 1 January 2011, the combined party briefly used the name NPD – Die Volksunion (NPD - The People's Union). Between 2004 and 2009 the two parties had agreed not to compete against each other in elections. However, on 27 January 2011, Munich's Landgericht (regional court) in a preliminary injunction declared the merger null and void. On 21 January 2005, during a moment of silence in the Saxon state assembly in Dresden to mark the 60th anniversary of the liberation of the Nazi Auschwitz extermination camp, twelve members of the NPD walked out in protest. The NPD stated that they were upset that a moment of silence was being held for those who died in the Auschwitz camp and that none was being given for those who died during the bombing of Dresden in World War II, with the anniversary of both events falling relatively close to each other. Holger Apfel, leader of the NPD in Saxony and deputy leader of the party nationwide, made a speech in the Saxon State Parliament in which he called the Allied forces of the United States and the United Kingdom "mass murderers" because of their role in the bombing. 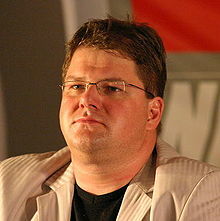 His colleague Jürgen Gansel went on to describe the bombing itself as a "holocaust of bombs". Voigt voiced his support and reiterated the statement, which some controversially claimed was a violation of the German law which forbids Holocaust denial. However, after judicial review, it was decided that Udo Voigt's description of the 1945 RAF bombing of Dresden as a holocaust was an exercise of free speech and "defamation of the dead" was not the purpose of his statement. In 2009, the NPD joined the Junge Landsmannschaft Ostdeutschland in a demonstration on the anniversary of the bombing of Dresden in World War II. Roughly 6,000 people came to participate in the event. The NPD's strategy has been to create "national free-zones" and circumvent its marginal electoral status by concentrating on regions where support is strongest. In March 2006, musician Konstantin Wecker tried to set up an in-school anti-fascist concert in Halberstadt, Saxony-Anhalt two weeks before the state elections. The NPD argued that because of politics, the date and the in-school venue, the concert "was an unacceptable form of political campaigning." In protest, the NPD vowed to buy the tickets and turn up en masse at Wecker's show, which led local authorities to cancel the event. The Social Democrats and the Greens were outraged by the decision, which the Central Council of Jews in Germany criticized as "politically bankrupt". The NPD was going to sponsor a march through Leipzig on 21 June 2006, as the 2006 World Cup was going on. The party wanted to show its support for the Iranian national football team, which was playing in Leipzig, and Iranian President Mahmoud Ahmadinejad. However, the NPD decided against the demonstration; only a counter-demonstration took place that day, in support of Israel. During the World Cup, the party's web site stated that due to the prevalence of people of non-German descent on the German national football team, the team "was not really German". Later in 2006, the party designed leaflets, which said "White – not just the color of a jersey! For a true National team!" This leaflet was never mass-distributed, but copies were confiscated during a raid on the NPD's headquarters, when authorities had been hoping to find material linking the party to Nazism. Patrick Owomoyela was later informed about the poster after it was noted that the image depicted a footballer wearing a white jersey with Owomoyela's number on it. Owomoyela, of Nigerian descent, had played for the German national team in the years before the World Cup and proceeded to file a lawsuit against the party. The party was able to delay the procedures but in April 2009 three party officials (Udo Voigt, Frank Schwerdt and Klaus Bieler) were sentenced for Volksverhetzung (Voigt and Bieler to 7 months on probation, Schwerdt to 10 months on probation). In November 2008, shortly after the 2008 United States presidential election, the NPD published a document entitled "Africa conquers the White House" which stated that the election of Barack Obama as the first African-American President of the United States was the result of "the American alliance of Jews and Negroes" and that Obama aimed to destroy the United States' "white identity". The NPD claimed, "A non-white America is a declaration of war on all people who believe an organically grown social order based on language and culture, history and heritage to be the essence of humanity" and "Barack Obama hides this declaration of war behind his pushy sunshine smile." The NPD also stated that the extensive support for Obama in Germany "resembles an African tropical disease." In September 2009, another incident involving the NPD and a football player of the German national team was reported. In a television show of a regional channel, NPD spokesman Beier called midfielder Mesut Özil a "Plaste-Deutscher" ("Plastic German" or "ID Card German"), meaning someone who is not born German, but becomes German by naturalisation, particularly for certain benefits. The German Football Association announced that they would immediately file a lawsuit against the NPD and their spokesman, if requested by Özil. During the Gaza War in 2009, the NPD planned a "Holocaust vigil" for Gaza in support of the Palestinians. Charlotte Knobloch, the head of the Central Council of Jews in Germany, said "joint hatred of everything Jewish is unifying neo-Nazis and Islamists." Knobloch claimed German-Palestinian protestors "unashamedly admitted" that they would vote for the NPD during the next election. In April 2009, the party was fined 2.5 million Euro for filing incorrect financial statements, resulting, according to German broadcaster Deutsche Welle, in "serious financial trouble" for its administration. On 23 September 2009, four days before the federal elections, German police raided the Berlin headquarters of the NPD to investigate claims that letters sent from the NPD to politicians from immigrant backgrounds incited racial hatred. The NPD leader in Berlin defended the letters saying that "As part of a democracy, we're entitled to say if something doesn't suit us in this country." In 2011, authorities were reportedly trying to link the party, and specifically 30-year-old national organization director Patrick Wieschke, to the so-called "Zwickau terrorist cell". This raised the possibility of another effort to outlaw the party. The cell had been implicated in a string of murders and the November robbery of a savings bank in Eisenach. Authorities were also pursuing a gun case against Ralf Wohlleben, former deputy chairman of the party's branch in Thuringia, though the latter case was reportedly unlikely to translate into a national-level challenge to the party's legal standing. The likelihood of success of renewed banning attempts has been questioned, given the Office for the Protection of the Constitution has over 130 informants in the party, some in high positions, raising the question of whether the party is effectively controlled by the government. In June 2012, several NPD members of Saxony's parliament attended the parliament's sittings wearing clothing from Thor Steinar, a clothing brand that is popular amongst neo-Nazis; the legislature responded by saying that such provocative clothing was not permitted to be worn in the parliament and demanded that the NPD members remove and replace their attire; the NPD members refused, resulting in the members being expelled from the parliament and banned from attending the next three parliamentary sittings. The NPD members denied accusations that they wore the shirts as a deliberate provocation. German officials tried to outlaw the party again in December 2012, with the interior ministers of all 16 states recommending a ban. The Federal Constitutional Court is yet to vote on the recommendation. In March 2013 the Merkel government said it would not try to ban the NPD. German officials again tried to outlaw the NPD by submitting a request to the Federal Constitutional Court in 2016. On January 17, 2017, the second senate of the Federal Constitutional Court rejected the attempt to outlaw the party. The reasoning behind the decision was that the NPD's political significance is virtually nonexistent at the state and federal levels and that banning the party would not change the mindset of its members, who would either simply form a new movement under a different name or flock over to the Alternative for Germany (AfD) Party - another far-right wing political party in the country which is more popular than NPD. However, the Court also openly acknowledged that NPD is unconstitutional based upon its manifesto and ideology, citing "links to neo-Nazis" and that "anti-semitism was a structural element of the party ideology." The Court also indirectly suggested that such a party should not be receiving state grants to further its cause. This prompted calls for the proposal of a constitutional amendment which would forbid anti-constitutional parties' financing to the Basic Law for the Federal Republic of Germany. The proposal was criticized by the interior policy spokesman of Die Linke, who claimed that such a constitutional amendment could stand to serve as a politically dubious way to remove a political opponent. Law Professor Hans Herbert von Arnim defended the rights of small parties, including the NPD. Ackermann, Robert: Warum die NPD keinen Erfolg haben kann – Organisation, Programm und Kommunikation einer rechtsextremen Partei. Budrich, Opladen 2012, ISBN 978-3-86388-012-5. Brandstetter, Marc: Die NPD unter Udo Voigt. Organisation. Ideologie. Strategie (= Extremismus und Demokratie. Bd. 25). Nomos Verlag, Baden-Baden 2013, ISBN 978-3-383-29708-3. Prasse, Jan-Ole: Der kurze Höhenflug der NPD. Rechtsextreme Wahlerfolge in den 1960er Jahren. Tectum-Verlag, Marburg 2010, ISBN 978-3-8288-2282-5. Philippsberg, Robert: Die Strategie der NPD: Regionale Umsetzung in Ost- und Westdeutschland. Baden-Baden 2009. ^ a b "Neo-Nazi NPD party takes hold in municipal vote in Saxony". thelocal.de/. 9 June 2008. Retrieved 10 June 2009. ^ "Neo-Nazis push into town councils". thelocal.de. 9 June 2009. Retrieved 10 June 2009. The neo-Nazi NPD party is entering several German city parliaments for the first time after this weekend’s local elections, news magazine Der Spiegel reported on Monday. ^ "Neonazis in der NPD auf dem Vormarsch". sueddeutsche.de. 19 May 2009. Retrieved 23 August 2009. Das neonazistische Spektrum hat seinen Einfluss innerhalb der NPD ausgebaut. Encyclopedia of modern worldwide extremists and extremist groups by Stephen E. Atkins. p. 106 "the oldest of the German neo-Nazi parties"
Germany transformed: political culture and the new politics, by Kendall L. Baker, Russell J. Dalton, Kai Hildebrandt. p. 318 "the neo-Nazi NPD (National Democratic Party of Germany)"
Europe since 1945: an encyclopedia, Volume 2, by Bernard A. Cook. p.903 "possibly deserving of the label "neofascist" .... The NPD was founded in 1964 by survivors of the overtly neo-Nazi SRP"
The Routledge companion to Nazi Germany by Roderick Stackelberg. p.287 "a Neo-Nazi party founded in 1964 in West Germany"
Encyclopaedia of international law by Vinod K. Lall, Danial Khemchand. p. 180 "frankly fascist NPD", "the Neo-Nazi NPD", "this neo-Nazi organization"
The beast reawakens by Martin A. Lee. "neo-Nazi NPD"
^ Verfassungsschutzbericht 2010 (PDF). Ministry of the Interior, Germany. 2011. p. 67. Archived from the original (PDF) on 16 December 2011. Die ethnisch homogene „Volksgemeinschaft“ stellt für sie das Kernelement dar. ^ a b Nagle, John D. (1 December 1970). The National Democratic Party: Right Radicalism in the Federal Republic of Germany. Hardcover. ^ Manuela Caiani; Donatella della Porta; Claudius Wagemann (16 February 2012). Mobilizing on the Extreme Right: Germany, Italy, and the United States. OUP Oxford. p. 194. ISBN 978-0-19-964126-0. ^ "NPD – einzige ernstzunehmende nationale Kraft!". npd.de. 28 September 2009. Archived from the original on 22 November 2012. Retrieved 14 February 2012. ^ a b "NPD – Start". Npd.de. Archived from the original on 25 November 2010. Retrieved 15 January 2015. ^ "Neo-Nazi NPD party takes hold in municipal vote in Saxony". thelocal.de/. 9 June 2008. Retrieved 10 June 2009. ^ "Neo-Nazis push into town councils". thelocal.de. 9 June 2009. Retrieved 9 June 2009. The neo-Nazi NPD party is entering several German city parliaments for the first time after this weekend’s local elections, news magazine Der Spiegel reported on Monday. ^ "Poll shows majority of Germany believe NPD to be non-democratic and damaging to Germany's image". spiegel.de. 22 September 2006. Retrieved 21 July 2009. ^ "Rechtsextremismus". Bundeszentrale für politische Bildung. 2006. Archived from the original on 22 February 2012. Retrieved 15 October 2015. Auch zeigte sich die NPD nun bereit, mit radikalen Kräften aus dem parteiungebundenen Spektrum zusammenzuarbeiten. Formal gilt nach wie vor ein Unvereinbarkeitsbeschluss der NPD-Mitgliedschaft mit der Mitgliedschaft in verbotenen Gruppierungen. Faktisch jedoch setzt sich die NPD mit ihrer Strategie bewusst über die offizielle Verlautbarung hinweg. Die NPD wolle in Zukunft mit denjenigen zusammenzuarbeiten, die dazu bereit seien, "als politische Soldaten zu denken und zu handeln", so die neue Strategie. ^ "Zusammenspiel zwischen NPD und Neonazis im niedersächsischen Landtagswahlkampf". Landesamt für Verfassungsschutz Bremen. 30 November 2007. Retrieved 2 August 2009. Die Kooperation zwischen der NPD und den Freien Nationalisten (Angehörige von neonazistischen Kameradschaften) prägt das Auftreten der Partei im niedersächsischen Landtagswahlkampf. Bekannte Neonazis treten für die NPD als Direktkandidaten an, z.B. Dennis BÜHRIG in Bergen, Klaus HELLMUND in Celle, Mathias BEHRENS in Soltau oder Dieter RIEFLING in Hildesheim. ^ a b Austrian 'neo-Nazi' joins NPD's executive committee Archived 31 May 2011 at the Wayback Machine. Austrian Times. Published 8 April 2009. ^ a b Zicht, Wilko. "Wahlergebnisse" (in German). Wahlrecht.de. Retrieved 5 May 2014. ^ 23.07.08 (23 July 2008). "Ehemaliger Pfleger von Rudolf Heß wirbt bei NPD". Morgenpost.de. Retrieved 19 April 2012. ^ "After Nominating Rudolf Hess for Nobel Peace Prize: NPD Leader Charged with Inciting Race Hate". Der Spiegel. Reuters. 24 August 2007. Retrieved 15 October 2015. ^ Map of Germany Map of Germany on NPD's website (www.npd.de). Archived from the original (5 September 2005) Archived 4 March 2009 at the Wayback Machine at 18 August 2013. ^ a b c "National Democratic Party of Germany (NPD)". Encyclopædia Britannica. Retrieved 9 November 2015. ^ 592. "Report of the Verfassungsschutz". Verfassungsschutz.de. Retrieved 19 April 2012. ^ Duke, David (1998). "My Awakening: A Path to Racial Understanding". Free Speech Press. Retrieved 15 October 2015. ^ Feldman, Matthew (2004). Fascism: Post-war fascisms. Taylor & Francis. p. 371. ISBN 978-0-415-29020-3. ^ Scully, Derek (11 October 2002). "Extreme-right group confirms Barrett link". The Irish Times. p. 1. Justin Barrett was an honorary guest at our event in Passau. I invited him. He sat with the delegates," said Mr Holger Apfel, the deputy leader of the NPD. "We have been in contact with his group since 1996. We are friendly with his Youth Defence organisation. ^ Scully, Derek (12 October 2002). "'Neo-Nazis' affirm links with Youth Defence". The Irish Times. p. 9. A leading far-right politician in Germany has described the anti-abortion group Youth Defence as "an important part of our international network". Youth Defence is the backbone of the No to Nice Campaign, whose chief spokesman is Mr Justin Barrett. ^ Humphreys, Joe (12 October 2002). "Barrett admits he attended far-right meeting". The Irish Times. p. 9. Mr Barrett, who earlier this week declined to confirm or deny to The Irish Times his attendance at the meeting in the Bavarian city of Passau in May 2000, yesterday admitted he attended the conference, as well as an estimated two other events linked to the NPD. ^ Ignazi, Piero (2003). "Extreme Right Parties in Western Europe". p. 66. ^ a b c Chapin, Wesley D. (1997). Germany for the Germans?. Greenwood Publishing Group. pp. 70–73. ISBN 0-313-30258-8. ^ "Election Resources on the Internet: Elections to the German Bundestag - Results Lookup". www.electionresources.org. Retrieved 5 November 2016. ^ Carr, William (1991). A History of Germany: 1815-1990 (4th ed.). London, United Kingdom: Hodder & Stoughton. p. 383. ^ Laqueur, Walter (1996). Fascism: past, present, future. Oxford University Press. p. 110. ISBN 978-0-19-509245-5. Retrieved 14 November 2011. ^ "Poll boost for German far right". BBC News. 18 September 2006. Retrieved 19 April 2012. ^ Jennifer L. Hochschild; John H. Mollenkopf (2009). Bringing Outsiders in: Transatlantic Perspectives on Immigrant Political Incorporation. Cornell University Press. p. 147. ISBN 0-8014-7514-7. ^ "Verfassungsschutzbericht 2008". Verfassungsschutz.de. May 2009. p. 79. Retrieved 23 August 2009. Mit rund 7.000 Mitgliedern verzeichnete die NPD im Vergleich zum Vorjahr (7.200) einen leichten Rückgang, bleibt jedoch mitgliederstärkste Partei im rechtsextremistischen Spektrum. ^ "Meet the new faces ready to sweep into the European parliament". The Guardian. 26 May 2014. Retrieved 11 January 2015. ^ Hooper, John (19 March 2003). "German court rejects attempt to ban neo-Nazi party". The Guardian. London. Retrieved 19 May 2010. ^ Gensing, Patrick (5 April 2009). "Die NPD bekämpft aktiv die Verfassungsordnung". tagesschau.de (in German). Retrieved 15 October 2015. ^ "German neo-Nazi parties 'consider merger'". The Daily Telegraph. London. 4 June 2010. ^ Frank Jansen (27 January 2011). "Rechtsextreme Parteien: Fusion von NPD und DVU ist unwirksam – Politik – Tagesspiegel" (in German). Tagesspiegel.de. Retrieved 23 September 2018. ^ Hannah Cleaver, "German ruling says Dresden was a holocaust", Telegraph.co.uk, 12 April 2005. ^ "Neo-Nazis hijack Dresden ceremony in the biggest far-right demonstration since Hitler". The Independent. London. 14 February 2005. Retrieved 19 May 2010. ^ Donahue, Patrick (14 February 2009). "Skinheads, Neo-Nazis Draw Fury at Dresden 1945 'Mourning March'". Bloomberg L.P. Retrieved 14 February 2009. ^ "Deutsche Welle article". Dw-world.de. Retrieved 19 April 2012. ^ "NPD leader charged for racist campaign against black player in national football team". Spiegel.de. 25 March 2008. Retrieved 21 July 2009. ^ Calls for prosecution after German politician says Obama win 'a declaration of war' by Jon Swaine, Telegraph.co.uk, 11 November 2008. ^ Racism Rears Its Head in European Remarks on Obama by Craig Whitlock, Washington Post, page A15, 11 November 2008 (retrieved on 5 December 2008). ^ "NPD-Politiker beleidigt Özil – DFB prüft Klage – Fußball – MSN Sport". Sport.de.msn.com. 31 December 1999. Archived from the original on 22 September 2009. Retrieved 15 October 2015. ^ Weinthal, Benjamin (22 January 2009). "European Jewish Congress – Neo-Nazis plan Gaza 'Holocaust' vigil in Berlin". Eurojewcong.org. Retrieved 19 April 2012. ^ Far-right politician convicted over racist World Cup flyers. Deutsche Welle. Published 24 April 2009. ^ "German 'race hate' letters probed". BBC News. 23 September 2009. Retrieved 19 April 2012. ^ "NPD sends offensive letter to candidates with Turkish background". DW.de. 22 September 2009. Archived from the original on 9 October 2012. Retrieved 15 October 2015. ^ "Neo-Nazis tell immigrants to 'go home'". AFP. 23 September 2009. Archived from the original on 31 December 2012. Retrieved 15 October 2015. ^ "Anger results after German neo-Nazis tell immigrant candidates to 'go home'". Canada.com. 22 September 2009. Archived from the original on 7 November 2009. Retrieved 15 October 2015. ^ Bartsch, Matthias et al. (alpha list), "Germany Faces Tough Battle to Ban Far-Right NPD", Der Spiegel, 12/07/2011. Trans. from the German by Christopher Sultan. Retrieved 8 December 2011. ^ "Infiltrating the Far-Right: German Intelligence Has 130 Informants in Extremist Party – SPIEGEL ONLINE". Der Spiegel. Retrieved 19 April 2012. ^ a b "German far-right deputies expelled over clothing", BBC News, 13 June 2012. Accessed on 17 June 2012. ^ "Germany seeks to ban far-right party". 3 News NZ. 6 December 2012.